Decorate the tropical Christmas tree in seashells and beachy ornaments, and finish it off with a tree skirt to match the theme. For those who live in a warm climate the holiday season means incorporating some nautical elements. Christmas tree skirts are the finishing element to add after the tree is all decorated. Tree skirts can be plain and simple or beaded and extravagant. In general, stores tend to carry traditional red and green colors or winter themes. To find offbeat and unique tree skirts, one will need to shop elsewhere. At Zazzle a tree skirt can be personalized, with a monogram, family name or custom saying. I'll show you some options on this page, and they will all have a coastal theme. All the tree skirts on this page measure 44 inches in diameter. They come in three types of material, and all are made in the USA. The Brushed Polyester is the cheapest choice, and is machine washable, but lay flat to dry. Faux Linen is also machine washable, lay flat to dry. This one is five dollars more. The Coral Fleece is spot clean or dry clean only. There are no snaps or ties to close the opening, which makes it easy to fit around any size tree. Starfish, or sea stars, are a popular choice for any type of beach themed decor. Aside from sand dollars, the starfish is one of the most sought after "sea shells" for beach-combers. The starfish used for the tree skirt designs in my shop are either white, 5-legged sea stars or brown, 5-legged sea stars. These types are the most easily recognized, even though starfish come in a variety of sizes and can have more than five legs. The starfish and holly leaves graphic design I have created is one that sells very well in my Holiday Store on the Zazzle site. Starfish create a prominent beach theme. No matter where you live, do you set up themed Christmas trees? Yes, I do a beach / tropical themed tree. Yes, I have more than one themed tree. I love to work with flowers in my designs, so of course I made floral tree skirts. The hibiscus flower is probably the most prominent tropical flower. It grows in a variety of bright colors and the bloom can be huge. Plumeria flowers are used to make Hawaiian leis. They also grow in a range of colors, but are smaller than hibiscus. I've also made Christmas tree skirts using the plumeria flower. The bird-of-paradise is a stand-out specimen for it's unusual shape, bright color and large bloom. Pointed, bright yellow petals mix with blue and green colors on the end of a long stem. Pretty hibiscus, plumerias and floral artwork designs for under the Christmas tree. Flamingoes adorned in holiday wreaths make a unique pattern on our tropical themed Christmas tree skirts. 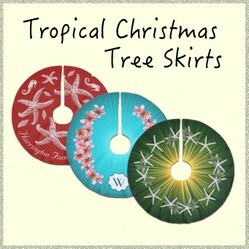 Their bright pink color matches aqua blue or beach sand tan quite well to create a lovely skirt for under the tree. People who live in warm climates sometimes like to carry that theme into the holiday decor. At the Holiday Store we wanted to give our customers another tropical option and pink birds fit the bill! Already the Flamingo skirts and other items are selling like hotcakes. Our flamingoes don't wear Santa hats, instead they have hibiscus and holly wreaths around their necks. They make a circular pattern around the edge of the skirt and stand among white sand dollars and pink starfish / sea stars. We have a couple of tree skirts featuring the flamingos, and also greeting cards and other paper goods. Click the image below to view the entire Flamingo design collection. Personalized tree skirts with rounded text along the front edge can contain a family name. Or create your own holiday saying. I have made a few tree skirts with this option. People love to create something that is their own, and adding a family name can definitely do that. Each of these skirts has a text template with wording which will wrap around the front of the skirt. Big starfish cover this tree skirt on a traditional Christmas red background color. Sea horses and little, spotted seashells complete the tropical design. Curved text along the front allows the purchaser to personalize it with a family name. Easily change the background color to anything - dark colors will work best as the design elements and text are white. How to change the color: Click the link, which will take you to the product page at Zazzle. Click on the "customize" button and scroll down to find the color chart. Click on any of the colors shown, or choose the eye-dropper to select an advanced color. Add your text to a tree skirt in a preferred color. Do you celebrate the holidays in the tropics? You have a nice selection. Zazzle has so many original designs, it is a good place to look for something different. These are cheerful Christmas options, Dustytoes. They'd be great especially for those who live by the seashore. When I lived in Florida, I collected tropical themed ornaments each year. I like that look too, even though I live in the northeast now. These are just fabulous! I really like a tropical look at Christmas! I love Christmas trees and usually have two or three of them. I admit that I'm pretty traditional, but our home is on the coast of Maine and I think the green tree skirt with starfish and holly would be lovely with my ornaments. Beautiful Christmas tree skirts with starfish and marine life. Lovely themes and they will look great with matching decor. Such lovely designs, bright and cheery!